The time signature of the Terminator score is a mystery for the ages. What Is the Time Signature of the Ominous Electronic Score of The Terminator? The Terminator, a merciless cyborg, cares not for time signatures. 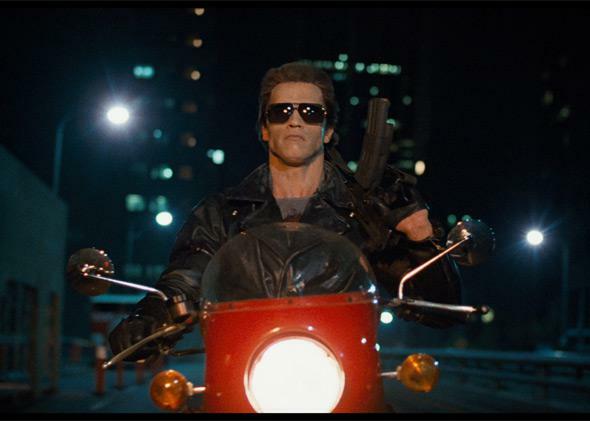 As The Terminator celebrates its 30th anniversary this year, the film continues to raise important questions. What are the risks to humanity of ascendant machine intelligence? How does a society correct the catastrophic missteps in its own past? And, most important, what the dickens is that weird time signature in the film’s score? The other day, upon realizing that 2014 marks three decades since the film was released, I decided to stream the cautionary robot fable to see how it held up. I didn’t make it past the opening titles. As the score kicked in, I immediately recognized it was in a strange time signature. I’m a (very) amateur musician, and my ears are attuned to bizarre beats. This was as jarring as it gets. A disorienting rhythm—in particular the driving, industrial-sounding beat that gets louder and more prominent as the opening theme progresses. It wasn’t in 5/4 or 7/8, both of which I can generally suss out with not much difficulty. I tried to count the beat in my head, and by tapping on my thigh: “DAH-doonk, dah-doonk, dah-doonk, gonk gonk.” But for the life of me I couldn’t make anything fit. My world had been ripped apart, much like Sarah Connor’s when she discovered she was being hunted by an implacable killing machine from the future. Similarly, when you hear a waltz you can usually count off “1-2-3, 1-2-3” without much trouble. Here’s an example of Elliott Smith weaving his way through 3/4 time. These are both easily digestible time signatures that are pleasing to our sense of order. Sometimes, however, a song will stray from the standard beats and get a bit weird. Dave Brubeck’s “Take Five” is the classic example of a song in 5/4 time. Listen to the repeating lick on the piano (“do-DA, do-DA, doo-DAH”) and steadily count out “1-2-3-4-5” with the 1 falling on the first “do,” the 3 near the second “DA,” and the 4-5 syncing with the “doo-DAH.” Another mainstream piece in an outré time: Peter Gabriel’s sprightly “Solsbury Hill,” which is in 7/4. You can hear the bass drum thump seven times with each line of the verse. OK, back to The Terminator. Come with me if you want to live … in a world where we definitively know the time signature of the film’s score. I paused the movie and took to the Internet, confident the source of all information would give me closure, letting me exhale and enjoy some unfettered cyborg ultraviolence. No such luck. I quickly found a thread on a message board for Lansing audio products in which my question had been posed, but the initial responses were all wrong or unhelpful. Someone offered a link to tablature in 3/4 time, which is incorrect. Someone else suggested it was in 6/8, when it clearly isn’t. My frustration mounted along with the original poster’s as he checked back in, still waiting for an answer. Soon I found another thread on a different message board where that same person had repeated his inquiry—and had again received unsatisfying results. I noticed that at the bottom of one of these threads a respondent had offered a plausible theory that the song was in 13/16. But the original poster still wondered: Where is the sheet music, or some other official source, so we can settle this once and for all? At this point I needed to know the full story. So I found Fiedel and got him on the phone. He was happy to take me back to the early ’80s and set the scene. He explained that before The Terminator, he’d worked on a score for a TV movie about Hitler’s last days. The producers were concerned that lush string music might lend sympathy to Hitler, so Fiedel conjured up a crashing, metallic ruckus. It was this sound that formed the germ of the later Terminator score. Fiedel was at heart an improviser. To create the Terminator theme, he first set up a rhythm loop on one of the primitive, early-’80s devices he was using. (In those days, Fiedel was firing up a Prophet-10 and an Oberheim.) He recorded samples of himself whacking a frying pan to create the clanking sounds. Then he played melodic riffs on a synthesizer over the looped beat. Amid the throes of creation, what he hadn’t quite noticed—or hadn’t bothered to notice—was that his finger had been a split-second off when it pressed the button to establish that rhythm loop. Being an old machine, there was no autocorrection. Which meant the loop was in a profoundly herky-jerky time signature. Fiedel just went with it. The beat seemed to be falling forward, and he liked its propulsiveness. He recorded the score that way and (not being classically trained) never wrote down any notation. The music he’d improvised went straight into the film. With its collaboration between fallible humanity and rigid machinedom, the score was especially well-suited to the material at hand. Much like the creators of Skynet, Fiedel was only later forced to consider what he had wrought. He got a call from the legendary film and TV composer Henry Mancini, who was planning to record an album of movie scores with a full orchestra. Fiedel was giddy to learn that Mancini wanted to include the Terminator theme. But then Mancini asked for the “lead sheet”—the notes the bandleader would use so the orchestra musicians could walk in off the street and nail the recording in one take. “Brad works mind to fingers to keyboard,” Kahn says now, “and he bypasses paper. So I had to sit down and figure it out.” You might say it was as though Kahn had been sent back in time to the early ’80s—dropped into a world that wasn’t his own and he didn’t understand—on a mission to safeguard the conception of a precious thing that he hoped would live on into the future. Sure enough, primed to listen for this grouping, I was at last able to count out the beat. DAH-two-three-DOONK-two-three-CLANK-two-three-GONK-two-GONK-two. Never has drumming on my thigh felt so cathartic. Brad Fiedel went on to write the theme for Terminator 2: Judgment Day (in the much less jarring time signature of 6/8, because he felt that film had more warmth), and scored various other film projects before leaving Hollywood to make his own music. He’s currently producing a one-man musical about the artistic arc of his career. George Kahn is a touring jazz musician with his own record label. Henry Mancini sadly died before he could record that album of movie scores. The Skynet artificial intelligence system went online in 1997, quickly achieved self-awareness, and remains dedicated to the extermination of all humanity.